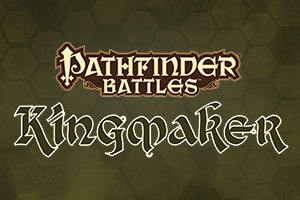 The latest set of pre-painted Pathfinder Battles minis, Kingmaker, were released in late October 2018. Pathfinder Battles minis are made by WizKids under license from Paizo Press. 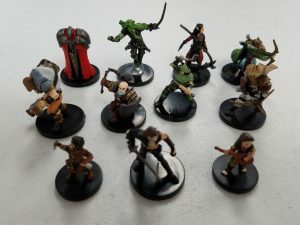 These minis are obviously specifically designed for the Pathfinder RPG game, but as this is a blog dedicated to Dungeons and Dragons, we are going to look at this set with an eye towards its relevance to D&D Dungeon Masters. 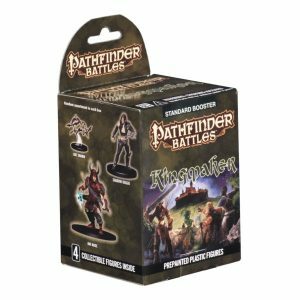 The Kingmaker set, like most Pathfinder Battles sets are released in 4 figure booster packs consisting of one large base figure and three medium or small base figures. Booster packs are typically sold in single units or in shrink-wrapped “bricks” of eight booster packs. 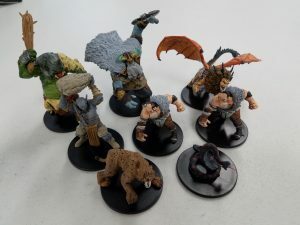 There are a total of 50 figures in the set–45 “regular” minis with collectors numbers on the bottom and 5 “dungeon dressing” accessory miniatures. 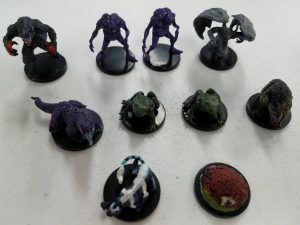 In addition, there are two huge base miniatures available as a separate purchase as case incentives for purchasing a full case (32 boosters) of the set. For Kingmaker, the two miniatures are an earth elemental and a water elemental. I recently opened a brick of Kingmaker with an eye towards what could be useful in a game of Dungeons and Dragons. The image below shows the large base figures that I obtained from the brick. From the back row, left to right is a Troll Leader (Uncommon), Frost Giant Jarl (Rare), Manticore (Uncommon), Large Spriggan (Uncommon), two Hill Giants (Uncommon), Smilodon (Uncommon), and a Swamp Naga (Uncommon). 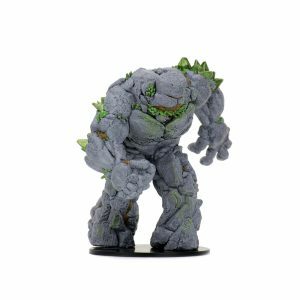 A couple of immediate thoughts–D&D 5th edition has moved to giants being huge in size and the minis now reflect that, although there are plenty of existing large based D&D giants. The hill giants are extremely undersized to reliably represent a D&D hill giant, although I think they would make a nice stand-in as an ogre. The frost giant jarl, while also on a large base, is still an impressive figure and I’d likely use this mini alongside other D&D frost giants in an encounter. The manticore is, hands-down, the best large base figure of the bunch. I’ve already used this figure in a game, and have since obtained a second one. 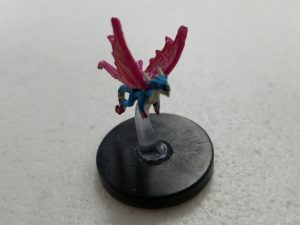 One thing to be aware of though–Pathfinder minis tend to be made of a less-flexible, more brittle plastic than their D&D counterparts, despite being made by the same company. Rough handling will lead to broken pieces on a mini this large and complex. Here is a closer shot of the manticore. The Spriggan will likely not get used, as that creature has not yet officially been introduced to 5th edition. There is a homebrew playable Spriggan race on DnDBeyond, for those who are interested though. The smilodon (saber-toothed tiger) will have limited use, but you never know–a saber-toothed tiger is a CR2 beast in 5th edition. The troll leader is an interesting figure. While no such specific troll exists in 5th edition, this would likely be a great fit in 4th edition when monsters had more variety within a creature species. Nonetheless, I plan on using this figure to add some variety when my group encounters a pack of trolls. 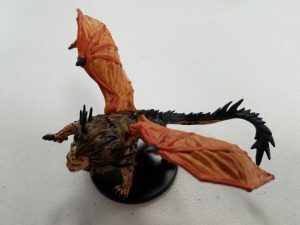 Finally, the swamp naga–while also not an official 5th edition creature, I can’t help but dislike this mini on a primal level. There is something creepy about the human-looking face with the tongue sticking straight out that will lead me to not include it in my collection. Here is a group shot of some of the medium base creatures. I won’t be listing every figure here, but will touch upon some of them. The leftmost figure in the back row is a really useful werewolf, while next to it are two purple web lurkers. I believe that these are the Pathfinder equivalent to ettercaps, and I plan to use these figures as such. 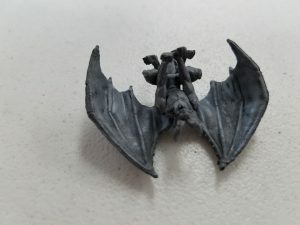 The final figure in the back row is one of the best in the set–a gargoyle. I only own one or two gargoyle figures and I can certainly use more. The two middle figures in the 2nd row are giant frogs–a very handy figure to have for running lower level adventures. A quick note about the red blob in the front row–this is evidently an “army ant swarm” although I struggle to make out any individual insects in the giant blob. One of the best figures in the set is this Fey Dragon–perfect for a pseudodragon familiar! Here is the remainder of the medium base creatures–mostly player character types, some of them rares. Some of the player character types would work well for D&D characters, others not so much. I particularly like the gnome alchemist (far left, front row). I plan on playing a gnome forge cleric of Gond in an upcoming campaign and will use this figure to represent my character. There is an interesting halfling bard, as well as a dwarven cleric. A few bandit type figures will also prove useful in any D&D game. The final set of figures in Kingmaker are five set dressing pieces. I got two of the five in the brick–a gargoyle without a base and a green…hedge…thing. Set dressings are becoming more and more popular in D&D games to add flavor and immersion to map-based encounters. The gargoyle on the right may be useful–but that depends on whether it can actually stand. It cannot stand on a large flat surface like a table due to the wing tips being lower than its legs. It will be interesting to see if I can pose it on top of a pillar or similar surface. The hedge is of dubious value. The piece seems to be referred to as a ‘brambly bush’, but it just likes like a big mess of green with brown sticks poking out to me. I would expect a mini of this quality to come in one of the toobs you can purchase at craft stores, not a Pathfinder Battles set. 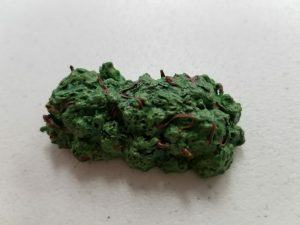 All five of the scenery pieces are rare, so unfortunately the green blob will replace something that could be far more useful to the average DM. The two case incentive miniatures are interesting figures. Both figures are extremely impressive, as can be seen below, but are probably not very useful to the average DM. 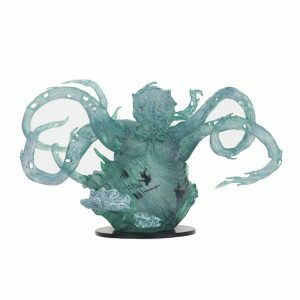 The water elemental is a beautiful figure, sculpted in a translucent blue plastic with swirling and tumbling player characters inside the body of the elemental. The figure looks impressively large–so much so that it would more appropriately represent Olhydra, the Elemental Princess of Water, rather than your run-of-the-mill water elemental. The earth elemental is also impressively large and could be used to represent Ogremoch, the Elemental Prince of Earth (although technically he should be gargantuan). Both figures are on huge sized bases (3×3), perfect for Olhydra, but too small for Ogremoch. Nonetheless, both of these figures are well-made and an impressive addition to any minis collection. Whether you are likely to use such a figure is debatable though.